To help fabricators and manufacturers drive continuous improvement in traceability, documentation, asset management, productivity and quality, ESAB Welding & Cutting Products demonstrated its new ESAB Digital Solutions platform at EuroBLECH which took place in Hannover, Germany. ESAB Digital Solutions, including ESAB WeldCloud and ESAB CutCloud, connect digital ecosystems for manual/robotic/automated welding and cutting automation, respectively. At Euroblech, ESAB showcased a new architecture, powered by Microsoft Azure IoT and utilising the ThingWorx Industrial Innovation Platform from PTC. “The right digital solution lets customers focus on improving their core business activities,” says Pantaleano. For companies without IIoT-enabled power sources, he notes that the new ESAB WeldCloud Universal Connector works with virtually any welding power source. It can send data to ESAB WeldCloud, including arc on time, welding parameters and start/stop information. New functionality in ESAB WeldCloud enables managers to view high-level dashboards with a simple click. For example, an operations manager could view the following data for a fleet of welding machines: total arc time, average arc time per weld, number of weld sessions, total weight of wire used, wire used by each station and average machine errors per session. A supervisor could easily view statistics for any welding operator, identifying desirable performance characteristics and then seek to replicate them. At IMTS, ESAB will also demonstrate other products in their integrated digital solutions including WeldQAS a real-time weld quality analytics product. Ready for connection to ESAB WeldCloud, WeldQAS provides the micro details required by engineers and quality assurance personnel. Where many weld data capture systems can only log data at 1 Hz, WeldQAS captures data at 23 kHz (and 234 kHz for stud welding). By comparing measured parameters with reference curves, the system calculates quality marks for each weld seam and provides an instant notification when an irregularity occurs. Faults detected can include poor arc ignition, porosity, burn-through, seam length (too long or short) and seam interruption. Without formal data analysis programs, welding and cutting operations tend to over-estimate equipment utilisation rates and under-estimate actual arc-on time when quoting products. For example, unproductive time might include grinding to compensate for a poorly prepared bevel or removing post-weld spatter. 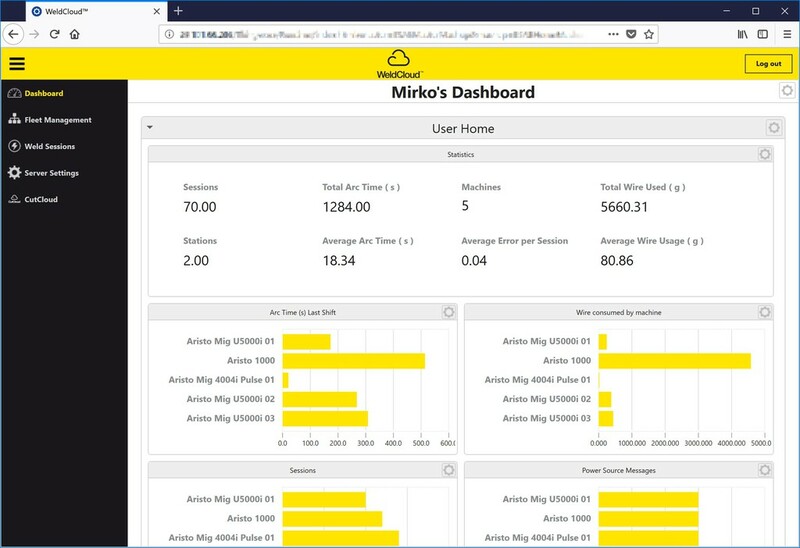 Having ESAB’s CutCloud also logging data from automated cutting systems, it allows customers to gain insights across their main aspects of the fabrication process. “When fabricators can document activity and associated costs, they can then justify investing in solutions, such as an automated plasma beveller or a premium electrode that reduces grinding time,” says Pantaleano. Documentation and traceability, required by the wind tower, offshore, pressure vessel and other industries, is another area where ESAB’s Digital Solutions can help. Spending large amounts of time generating reams of paper to do simple documentation is another example of non-productive time, and it is also prone to errors. Instead this activity can be done in a simple operator workflow, as simple as scanning a barcode. ESAB’s new WeldCloud scanning app enables, using a smart phone, a customer to scan parts and associated variables such as operator, welding or cutting machine and consumables. That information is then logged centrally as part of the weld session data.